This stunning and handsome designer cross pendant for men in 14K two-tone gold from Apples of Gold Jewelry is a lovely pendant to give the special man in your life. The 14K two-tone gold is made up of 14K yellow gold and 14K white gold, combining to make an eye catching design on the cross pendant. The stunning pendant features yellow gold on the ends of each cross arm, as well as a thin band making up the cross and around the center. 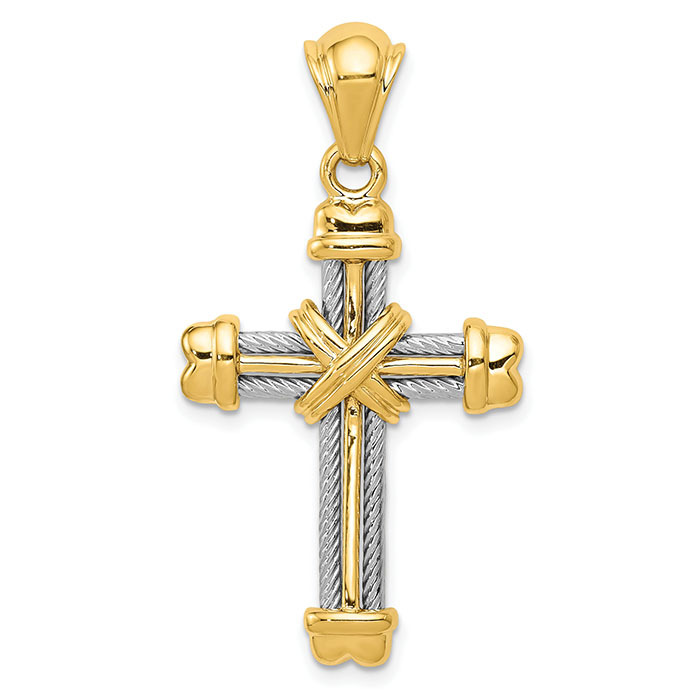 The edges of the cross is designed with textured 14K white gold. The pendant measures 1 9/16" tall (including the hoop and bale), and is 7/8" in width. The cross height without the hoop is 1 3/16" in size. The weight of the cross pendant is 4.6 grams of 14K gold. We guarantee our Designer Cross Pendant for Men in 14K Two-Tone Gold to be high quality, authentic jewelry, as described above.